​This post includes affiliate links. Should you make a purchase I may make a small commission at no extra cost to you. This top works up fast and easy! 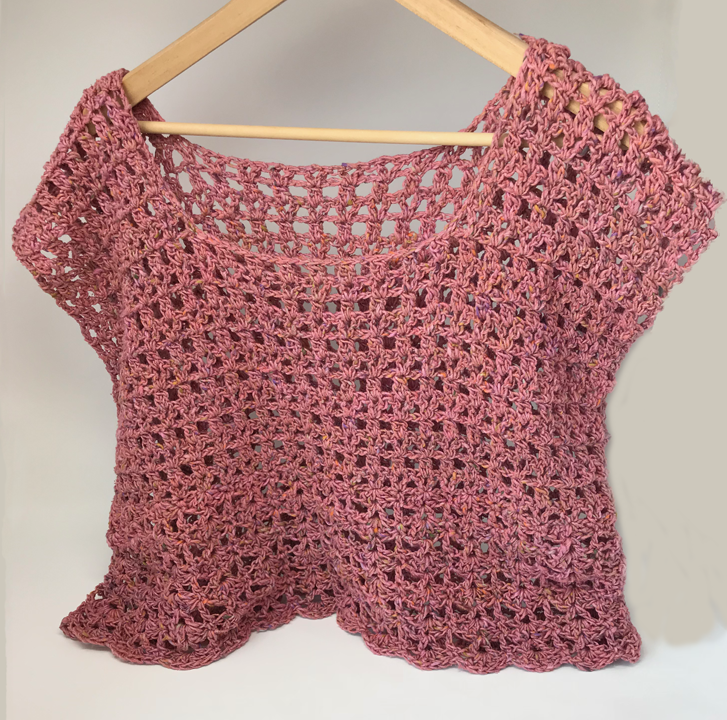 As shown is 4 balls of yarn to make it a tunic style you will need at least 6 or 7 balls or 9 balls for a swimsuit cover-up. Top is worked in 3 sections. First make 2 pieces front and back worked bottom to top shoulders mattress stitched together. Then working in the round front and back joined and stitched top to bottom. 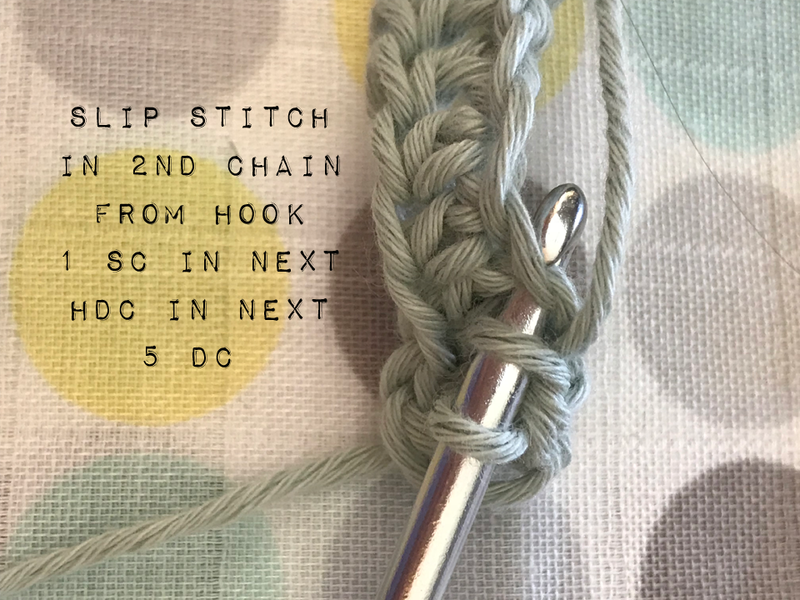 Row 1: In fifth ch from hook make a V Stitch sk 2 ch V stitch across until 2 ch sk 1 DC in last, ch 4 turn. Row 2: in ch 1 sp work a DC 2 Tog, ch 2, repeat across, DC in last st ch 3 turn. Row 3: In DC 2 Tog top sp V stitch across DC in last st, ch 4, turn. Row 16-20: repeat rows 15 & 16. Work all rows across except last 2 rows st in first 8 and again 8 for other shoulder. 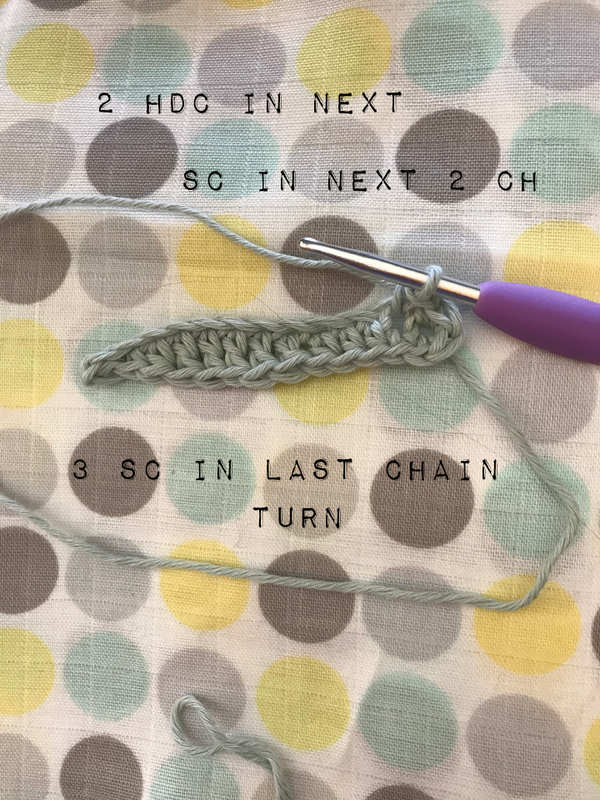 Row 1 in the round: Sc in same stitch in ch st where the first V stitch is 2 DC ch 1 2 DC in same ch, sc in next V stitch ch. 2DC ch 1 2DC in next repeat all the way around sl st to first sc. Row 2: ch 4 V ST in ch 1 sp, ch 1, DC in sc st, repeat around sl st to ch3 of turning ch. 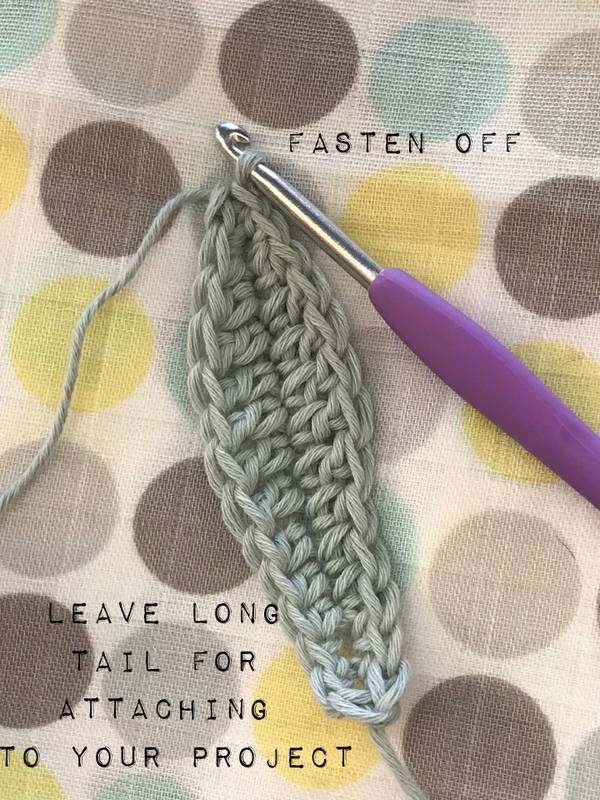 Repeat all rows until desired length. Last row will be: SS in top of joining DC, in top of V 2DC, ch 1, TC, ch 1, 2 DC, ss to top of next DC repeat around! Note: I sewed up 4 rows of the armhole to make it smaller you may leave it or even sew 5-6 rows up if you desire. You will notice this top is a little short you can make it any length or even a dress length for a swimsuit cover-up. I plan to finish off the last rows with a contrasting Noro yarn and add a sc row of contrast to armholes and neck. 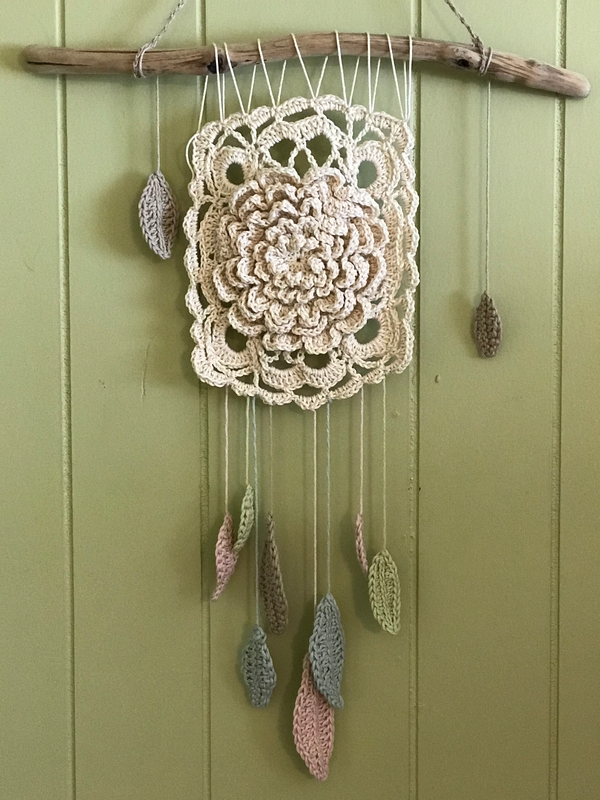 I used Paton's Grace cotton yarn, driftwood from my trip to Mendocino and some scraps of organic cotton for the leaves and hemp yarn to hang, fishing wire or more of the same yarn would work nicely too. before I could finish and I had to throw it away. 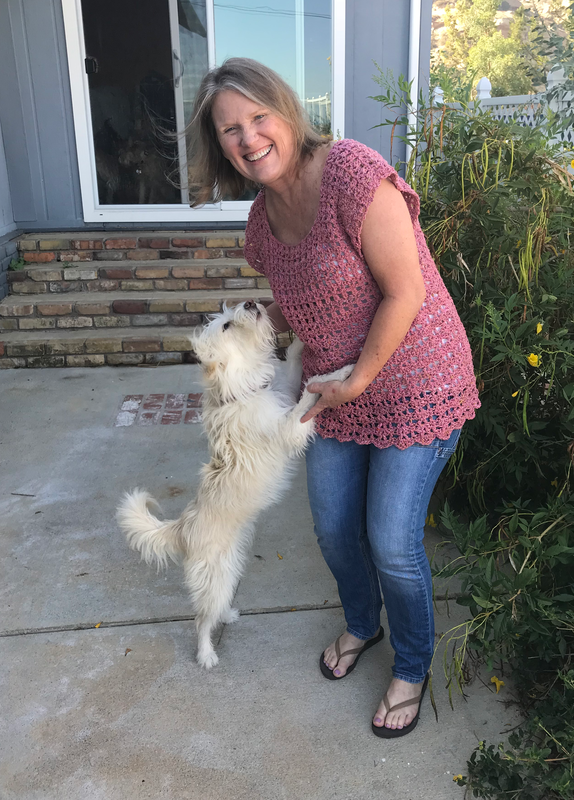 ​ That dog loves my yarn more than I do!! Naughty girl! 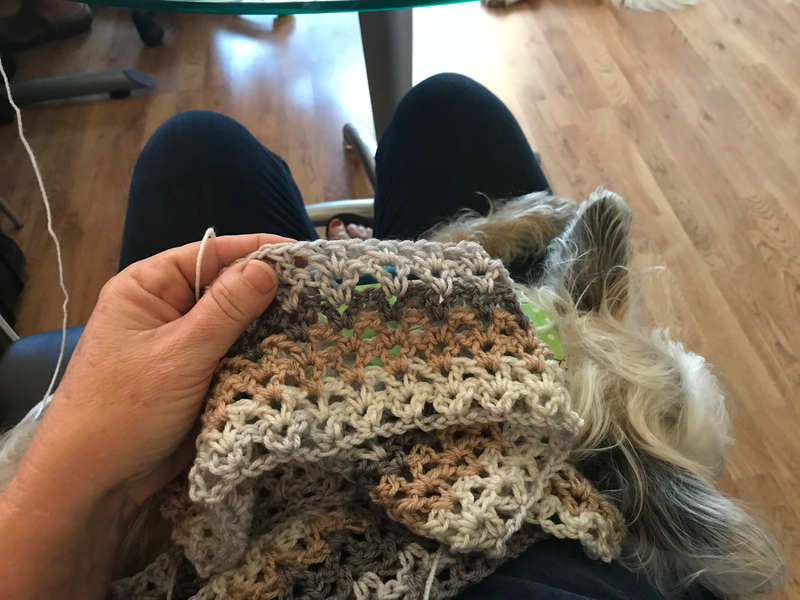 I added a row of chains and single crochet then one large row of scallops and one row of small. Attached it to the driftwood along with the cotton leaves and a little hemp cord for hanging. I think it would be a nice gift! You can make loads of leaves in all shapes, colors and sizes. Just vary your number of starting chains and stitches. Oh dear Pup P's hair matches the yarn colors! ​Felix aka Pup P, I can never resist those dark brooding eyes!! He is the smallest of the three and the fiercest! A love bug one minute and an ill tempered tyrant the next. 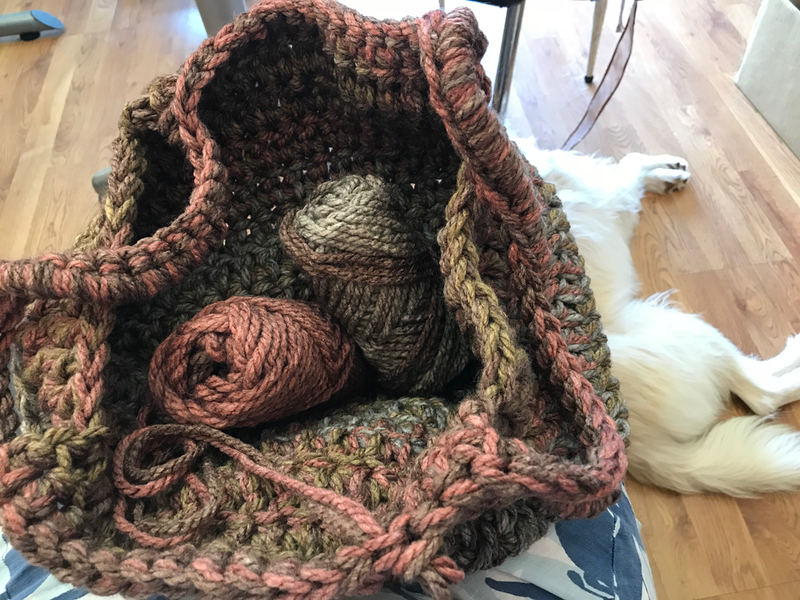 That great feeling you get when a package of yarn arrives just in time to finish up a project you didn't buy enough yarn for in the beginning! I am in love with this yarn!! At first I just wasn't having it about all the hype with Caron Cakes then the Tea Cakes and Sprinkles went on sale and I bought a few made a couple of projects and feel in love! Now I am ordering it because my store sold out. Once I finish with all the cakes I ordered I will have to find a new yarn to love! ​FYI that isn't the only box of yarn to arrive lately! 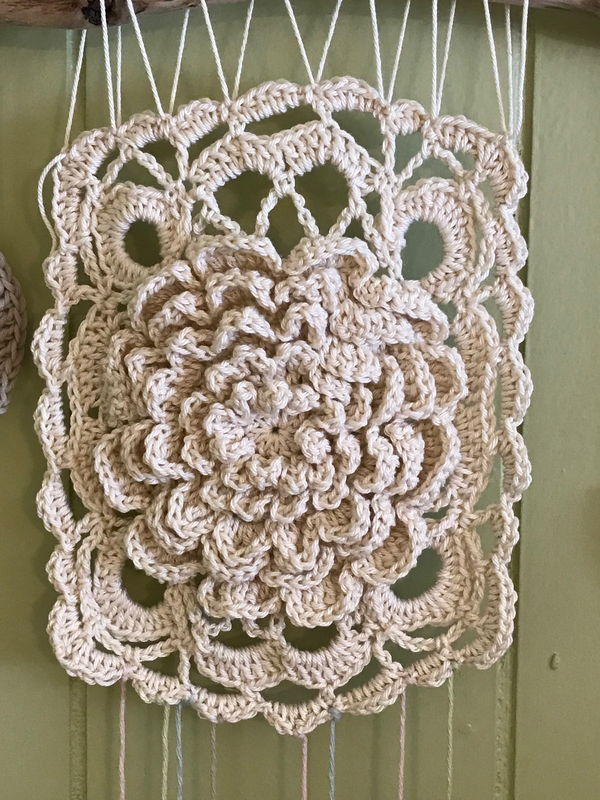 When it's 100 degrees in the shade what does a crazy crochet grandma do? 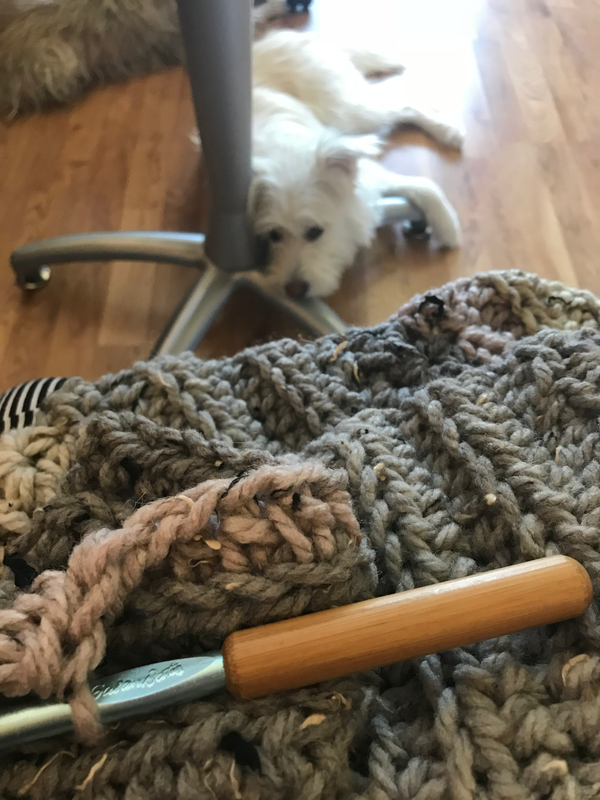 Well, make woolen blankets of course! Loving the rich color and textures of this pattern. ​ I think it would look great in any room especially in a modern or minimalist decor. I love this bag! 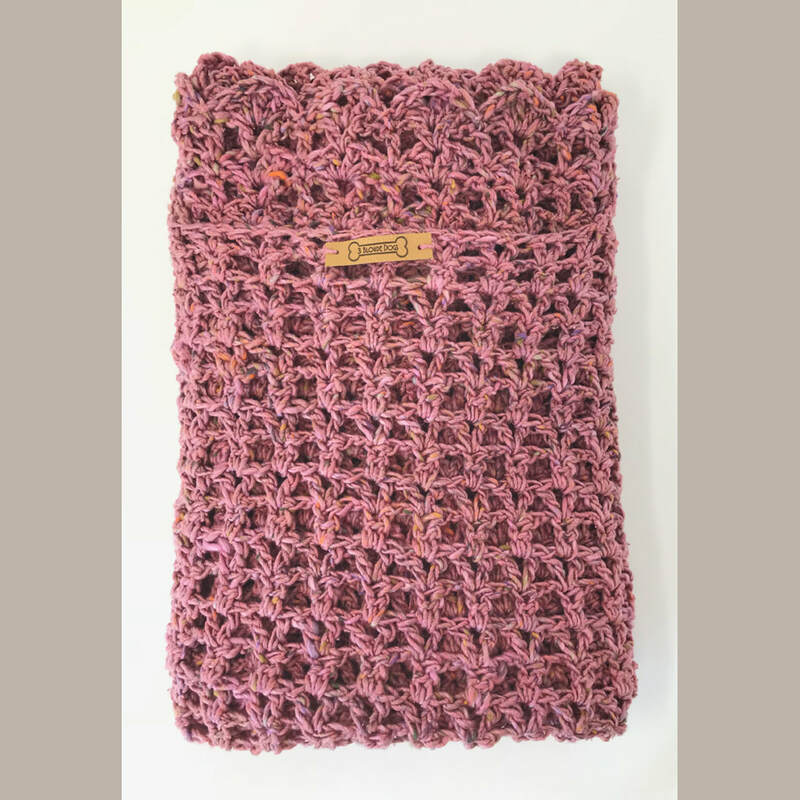 First it works up fast, only uses 2 cakes of yarn and it is sturdy enough you don't need a lining; however if you have small lipsticks and pens etc I would recommend putting them in a zippered pouch. And if you use it for your yarn stash you have an instant travel pillow too! Starting from the bottom up worked in the round. SS into 3rd CH from beginning. remaining ST, SS to top of CH 2. Row 3: CH 2, 1 DC in each ST all around. around. SS to CH 1. Row 5 – 13: CH 2 and DC in each ST around. and mark this will be for the handles. with safety pins or stitch markers. DC across and SS into top of CH 2. ST to desired length for closing I did 5 Rows. 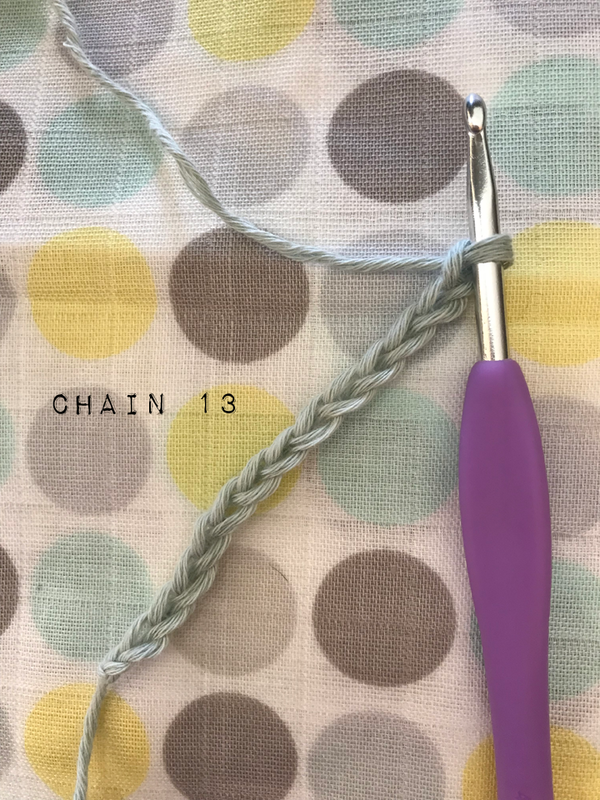 Make two tassels and attach to each end of chains. 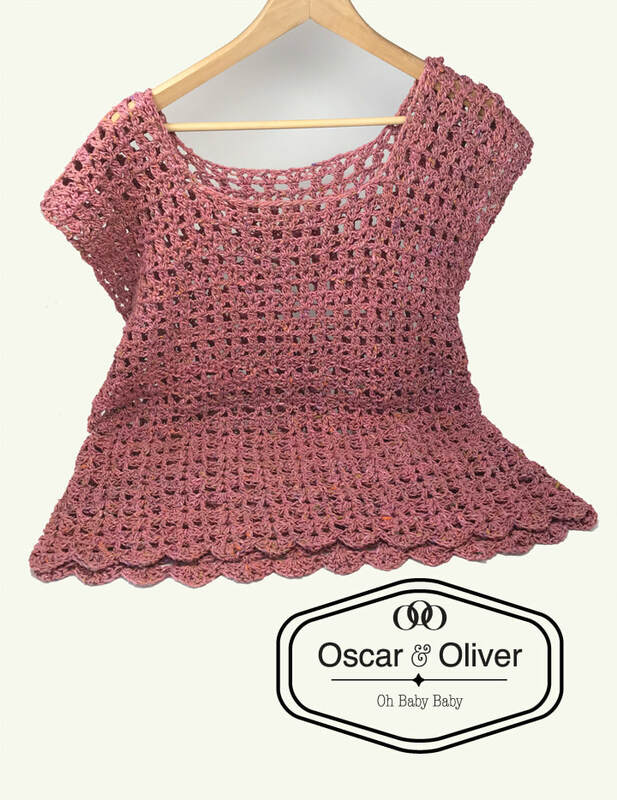 COPYRIGHT© Oscar & Oliver Oh Baby. All rights reserved. The content on this website may not be copied or reproduced in any manner whatsoever without prior written permission. This post includes affiliate links. Should you make a purchase I may make a small commission at no extra cost to you.